First of all, I’d like to make clear that what I wrote below is in no way related to the tragic events in Rally Deutschland, even though this accident prompted me to put this post together. I do not have information on what exactly happened in Panzerplatte and I am NOT relating anything in this post to this particular accident. OFFICIAL INFO (arrived after I posted the article): Two fatalities in Rally Deutschland were crew members of a historic rally car. No spectators were involved. Still, the points expressed below are my firm beliefs and I do hope they stand on their own. It should never happen, but it does and sadly it will happen again, at another rally – it’s just the nature of the sport, as harsh and cold as it may sound. When you have cars racing at 150 km/h through forests and around mountains, you are faced with the odds heavily stacked in favour of something bad happening at some point. Safety standards are very high and modern rally cars and safety gear is lightyears ahead of what we had at our disposal only 5 or 10 years ago. The seat belts, helmets, special seats and HANS devices, roll cages… cars today can endure massive impacts and protect the crews, but nobody can predict all the scenarios. Some fatalities and heavy accidents in recent years are grim proof of that fact. 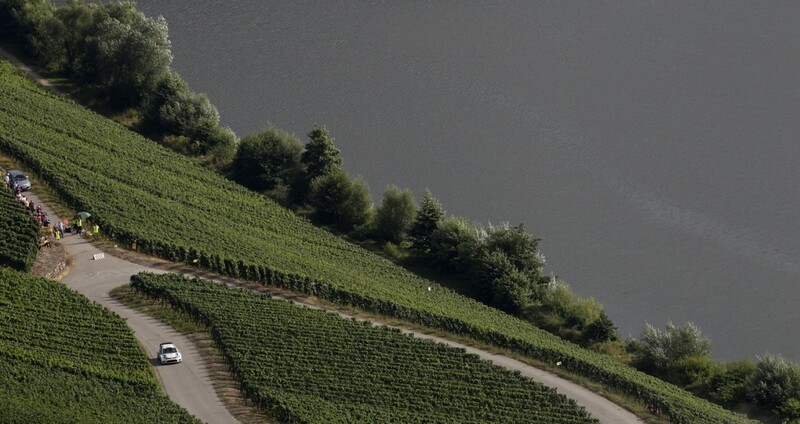 Once upon a time, during my very brief co-driving career, we were doing recce in a vineyard area, and I caught myself thinking about the risks of racing on a road which was set few meters above the surrounding vineyard fields, all lined up with concrete posts. Go off there and you could end up landing on one of those posts – land badly, and post will be in your cockpit. The risks of rallying are still extremely high, and as long as the sport keeps true to the roots of racing through all kinds of terrain, this will not change. Spectating is just the same. First and foremost, you should be thinking about your surroundings, at all times. If a car can reach your spectating spot in any imaginable way, then you should consider it VERY seriously, because at some point, this exact thing will happen. Do not rely on your ability to escape, do not rely on others as the more knowledgeable ones, rely on your common sense and put your mind to work (because there’s not much else you can do while waiting for the stage to begin, unless, of course, you’re in a full camping mode with food and booze, in which case you should NOT be anywhere near the road to begin with). Listen to marshals, because as silly as their instructions may be to you, they are there with a reason, and that reason is your and competitors’ safety. Their instructions are shaped by the security plan and people who have years of experience in organizing big motor sport events. They’ve seen things and they know, or at least should know, which spots and zones are safe and low risk. Keep your escape routes available, do not bloody sit or lay on the ground few meters away from the road, don’t crouch. Be alert and be cautious, it’s very possible to do so even if you are having fun and enjoying the driving skills of your heroes, the rally drivers and co-drivers. Remember, if a car can reach you on its own means, then act accordingly. Calculate in the speed, the surface, the fact that when rally cars are out of control, then they’re really bloody out of control. Rally drivers are among the most talented and skilled wheel wielders out there, but they’re not supermen. Even the robotic Sebastien Loeb misheard a pacenote and crashed out on occasion. Do NOT rely on rally drivers to keep you safe and out of harms way. They are busy worrying about their own and their co-drivers’ lives as it is. Be responsible in your spectating, do not be a jerk or the local comedian, making fun of marshals and trying to be a rebel for no reason at all. It will not get you laid, yeah, some people may laugh at you, but is this the best you can do. Don’t ruin it for everyone, because that’s exactly what such accidents do. I am not at all referring to the tragedy at Rally Deutschland, because I do not have all the information and I’m not insinuating that any of the “issues” listed in this post contributed to the tragedy in Germany, but I’ve seen what reckless spectating can do in other events over the years. Combine alcohol and “people are looking at me laughing, I must be the popular dude now” mentality with already high risk motor sport and you have a very dangerous mix. Having fun is perfectly fine on rally events, it’s what it’s all about, but this is not a football match or a chess game, these are big piles of steel, racing around at deadly speeds, people often seem to forget that. Lot of people put countless hours into rally events to make sure they run smoothly and safely, do not be the one person to jeopardize all that work and put others at risk of being hurt or killed. I will not go into the money debate here, I’m well aware of the fact that organizers and everyone really is short on cash these days – it would really take a fortune to provide the full marshal coverage of every damn corner and ensure that the protocols are respected. To cancel a stage because spectators cannot be controlled is also not a popular thing to do, because uproar and, wait for it, money, but it’s been done and should be done if there is no other way. But most of all, everyone, WRC, FIA, organizers, promoters, media people and teams, should always try to do more in terms of education. People should be made aware of the consequences. When tragedies happen and lives are lost, WRC community must bond together and speak even louder about the means to prevent such things in the future. Everyone must realize that the very future of the sport hangs in the balance, because once government steps in, with people who are not motor sport savvy and do not understand it, we could be in for a very very rough ride. There are many mixed thoughts about this in my head, but I felt the need to put at least some of it here, on the “paper”. I apologize in advance if these words are missing the point or even hurtful. It was not the intention of this post. My thoughts are with the WRC community of Rally Deutschland, families and friends of the two motor sport enthusiasts who lost their lives while enjoying their and our passion, rallying. Next story Dani Sordo? Yes, Dani Sordo!